Don't cut damaged hair, repair it. 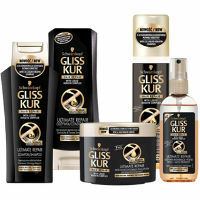 Introducing NEW hair care products from GLISS, the hair repair expert. Gliss combines patented keratin technology with essential benefits like color protection, intense hydration, long-lasting volume, and weightless nourishment, so you get the repair you need without having to compromise. Tried this for the first time.. loved it. Will need coupons to buy again.